Is the New iMac a Cash Machine? "...Somehow I ended up in an Apple store asking about the availability of the new Intel-based iMac. Yes, they had a few in stock, despite the lack of signage in the very crowded store (the employees manning the Genius Bar deserve a raise). "Long story short, I ended up lugging home a 20-inch model with the Intel Core Duo, and I have some thoughts for anyone considering whether to pick one up. "This is not a review, replete with benchmarks and Photoshop filter times (shorter bars are better) and musings on Rosetta emulation software. Rather, it's a list of some initial impressions on the newest iMac. Because the machine is virtually identical to its predecessor in appearance and operation (the new chip runs most software, although through emulation), I've included some thoughts on the process of upgrading to a new machine." "On the outside, the new Apple iMac (Intel Core Duo) ($1,699 direct, $1,799 as tested) looks no different than the previous PowerPC-based iMac G5 (iSight). The differences are all under the hood. The 20-inch new iMac combines a dual-core Intel Core Duo (formerly Pentium M or Yonah) processor with the Mac OS X experience. Casual Mac users, switchers from Microsoft Windows, and iPod aficionados will love the new iMac; however, professionals and people who use graphics apps such as Adobe Photoshop and Final Cut Pro should hold off until the critical app is updated to work smoothly with the Intel processor. For these people, we recommend holding on to your current G5-powered Mac, at least for now." "For years the thought of an Intel chip going into an Apple computer was enough to make those who love their Macs turn various shades of green. "But now that an Intel-chip Mac is a fact, is Apple seeing the green that accompanies cost savings and better profits? The verdict awaits, but it's possible. "But how does that compare to the last PowerPC-based iMac G5, released just last October?" Link: Is the New iMac a Cash Machine? Goldtouch Numeric Keypads are not compatible with Goldtouch Apple Compatible Keyboards. A Goldtouch Apple Compatible Numeric Keypad is currently being researched and developed. Goldtouch Apple Compatible Keyboard sells for $139. PR: US Modular, a designer and manufacturer of personal memory and storage products, has announced that the stainless steel Monstor Drive is now shipping in both four gigabyte and eight gigabyte models. The drives continue to have the same quality as previous US Modular Monstor Drives, but now have a sleek, cool look. Priced as low as $99, the Monstor Drive line is available exclusively with this high-tech look and feel. "We have had tremendous feedback on the stainless steel look since announcing the product in late 2005," said US Modular CEO Nick Payzant. "We have developed our entire drive line around this stainless steel design and we look forward to getting feedback from consumers who want the convenience of a portable drive in this new hot form factor." The palm-sized drives are slim and compact, but large enough to hold tens of thousands of data files, music, pictures and more on the go. With the onboard USB 2.0 port, files transfers are fast and easy and completely portable. Ideal for MP3 of video files, important JPEG files, or even redundant storage for irreplaceable data, the Monstor requires no external power and is both Mac and PC compatible - making its appeal universal. Proving that big things do come in small packages, these drives are the ideal mobile mass storage medium for executives, road warriors, students or anyone on-the-go. The "Monstor Drive" by US Modular (2 GB) costs about the same as a 512 MB flash drive and weighs about half an ounce. It fits in the palm of your hand, but packs enough memory to store more than 600 MP3 songs, over 350 photos or about 30 minutes of MP4 video! 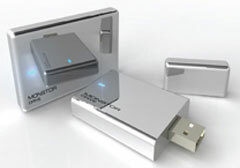 The 2 GB, 4 GB and 6 GB Monstor Drive will revolutionize the way you store, transfer, and transport files. No more piles of floppy disks or huge portable hard drives that always seem to turn up missing or get in the way. The Monstor Drive provides fast, reliable, cost-effective storage for any device with a USB port. The Monstor Drive supports Windows and Macintosh. No drivers are required. The stainless steel Monstor Drives are available nationwide. PR: G-Drive Q storage solutions offer the ultimate in flexibility by providing users with FireWire 400, FireWire 800, USB 2.0 and eSATA ports all in a single unit. G-Drive Q is the perfect high-performance solution for storage intensive applications including audio/video editing, digital photography MP3 libraries and high-speed data back up. 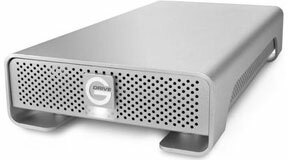 G-Drive Q offers the best performance of any single disk external storage solution currently available . . . data transfer rates up to 85 MB/second!. G-Drive Q utilizes Hitachi's latest technology 7200 RPM SATA II hard disk drives with 16 MB/cache. Available in capacities up to 500 GB, G-Drive Q can store over 38 hours of DV footage, 125,000 MP3 files or 250,000 digital pictures! Simply attach G-Drive Q to your Mac or PC via your interface of choice and initialize. That's all there is to it! Best of breed components coupled with superior design and high quality construction make G-Drive Q the storage solution of choice for professional applications. G-Drive is backed by the best support and warranty in the business. PR: Need a high capacity portable storage solution that can fit in your pocket but hold more data than your PC at home or work? US Modular's Dragon Drive is a 2.5" External Hard Drive Enclosure and is perfect for anyone needing a high capacity portable storage device. The Dragon Drive turns any 2.5" Hard Drive into a convenient portable storage drive that can be used on any system with a USB or FireWire port. The aluminum casing protects the drive from overheating and vibration. The Dragon Drive supports USB 1.1 and USB 2.0 and FireWire to offer fast transfer speeds of up to 480 MBPS. PR: FWB-IDE01A is ideally suited for tailgating interfaces such as removable-media drives (CD-ROM, CD-R, CD-RW, DVD-ROM, DVD-RAM), tape drives, and hard drives. It allows IDE drives (Master and Slave) to be connected to a FireWire 800 (IEEE 1394b) serial bus in a plug-and-play fashion. Both ATA and ATAPI devices are supported using the same firmware. FWB-IDE01A allows users to easily hot-swap IDE drive without interrupting the current operation. FWB-IDE01A provides the perfect solution for data backup and transferring of data between computers using IDE (ATA/ATAPI) devices. Both ATA and ATAPI devices are supported using the same firmware. Supports 48-bit addressing for large hard drives (>128 GB). End user can upgrade their SCSI enclosure to FireWire 800 (1394b) enclosure. SCSI Enclosure vendors using the ATA/ATAPI devices now have an immediate and no-risk solutions for adding FireWire 800 (IEEE 1394b) interface to their product lines. 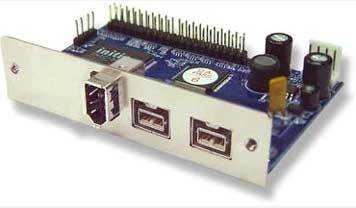 End user can replace a slow & expensive SCSI device with a cheap & fast EIDE device. This allows peripheral vendors a unique opportunity to continue the advantage of the ATA/ATAPI existing market advantages while presenting FWB-IDE01 into the rapidly expanding FireWire 800 (IEEE 1394b) markets. FWB-IDE01A FireWire 1394b bridgeboard $64.99. PR: Imagine opening your AirPort window and seeing a whole new set of available networks. Then imagine connecting to any of them, and at speeds that you never expected from any wireless connection. This is no longer a dream, it's reality when iMac G5 17" users add the QuickerTek 27dBm Transceiver. Rather than just a few networks, see a full menu of networks you know are normally just too far away for your iMac. Connect to friends in your neighborhood, connect to that Base Station that's on the far side of the office, get a strong signal in the basement from that Base Station on the third floor of your home. And each of these connections can be made at full speed - and that's the secret to the huge success of Transceivers. Instead of working around a slow or weak wireless connection, think of all the things you can do with a strong AirPort connection. You really can place your iMac where ever you want, instead of worrying about which location will give you the best wireless signal. This Transceiver is very powerful, yet still very easy to install and even easier to use. There is no exotic soldering, wiring or the need for an entire toolbox. It's not any larger than one of our 7dBi antennas, yet the power is phenomenal. This small QuickerTek 17" iMac G5 Transceiver clips temporarily onto the iMac case and the other end connects to the AirPort card inside the iMac G4. You can download the product manual from our website just to prove to yourself that you're capable of making it work. The hardware connection is easy and it is just as easy to use - requiring no extra steps. By adding ten times the normal RF power, the freedom to connect to longer distance wireless networks is a reality. Schools are delighted to be able to add iMacs at the far corners of buildings, without sacrificing signal strength or speed. The QuickerTek 17" iMac G5 Transceiver delivers a full 500 milliwatts of RF power. By comparison, iMacs tend to average little more than 30 milliwatts. The internal shielding that keeps the other parts inside your iMac from interfering with each other, also limits the effectiveness of the built-in AirPort wireless. Rick Estes, president of QuickerTek, Inc. stated, "We have had customers tell us that Transceivers solve a whole bunch of wireless problems. They have also told us that they were apprehensive and even nervous about purchasing a Transceiver, because it sounded too powerful and complex. Sure the technology is cutting edge, but you don't have to deal with the technology part, we've already done that for you. All you have to do is connect a couple of simple cables and you've got a whole new wireless world at your fingertips," Estes explained. "It's what iMac users expect - simple and effective performance. We even assure customers that our transceivers will work as described with a money-back guarantee," he continued. Ryan McKenzie, EchoTech Wireless, said, "iMac customers are very excited about the improvement in wireless performance. This new Transceiver is as straightforward to use as any wireless enhancement we've found. Once it's installed, iMac owners will see more available networks and be able to connect to them at satisfying speeds," he related. QuickerTek has been a recognized leading innovator of antennas and RF products for Apple Power Macintosh, iMac, PowerBook and soon the MacBook Pro computers. QuickerTek products can be purchased online and from authorized dealers. PR: 21st Century 3D has announced the introduction of the 3DVX3, the latest in their line of digital stereoscopic motion picture camera systems. The 3DVX3 represents 21st Century 3D's most significant advance in stereoscopic camera technology to date. This newly developed 3D camera-recorder features numerous evolutionary advances over previous 3DVX models, while maintaining the compact form factor and self contained design that has been a distinctive feature since the first generation. Foregoing tape, a unique direct to disk recording system captures RAW CCD data in 4:4:4 R GB color space at 10 bits per channel, producing remarkably vivid 3D images at up to 1280 x 720 per eye, 24 fps progressive. This unique capture method provides industry leading dynamic range and color fidelity, more akin to motion picture film than digital video. The genlock synchronized system features two entirely discreet image channels simultaneously captured by 6 CCDs, two onboard CPUs running Mac OS X with over 2.8 GHz of processing power, 2 GB of RAM, 8 GB of flash memory, and a maximum record time of one hour per eye on paired sets of 100 GB removable 7200 RPM drives. As in previous 3DVX cameras, the Panasonic AG-DVX100A serves as the core of the camera section. The 3DVX3 bypasses resolution and color limitations imposed by miniDV and takes full advantage of the higher resolution and 36 bit color quality the CCDs provide. Data is taken directly from the analog to digital converters and sent over USB 2.0, providing 600% more information than would be recorded to digital tape. An advanced demosaic algorithm is employed to achieved 1280 x 720p resolution. Since no color decimation or spatial compression is applied to any of the color channels, the 3DVX3 greatly exceeds the image quality of many HD and HDV systems. The built in recorder of the 3DVX3 is comprised of two extensively modified Apple Mac Mini computers. The compact size and CPU horsepower offered by the Mac Mini coupled with the power of Mac OS X make the 3DVX3 a truly unique camcorder. Flash memory modules replace hard drives in the Mac Minis for fast booting and reduced operating temperature. The all-new binocular electronic viewfinder utilizes high quality optics and the latest LCOS technology to provide a bright and crisp 800 x 600 (per eye) SVGA display under 10x magnification. The uncompressed output can be monitored via the BEVF or the built in left and right analog VGA ports. Analog composite, S-video and digital IEEE 1394 ports are also available for standard definition monitoring or additional output options. An external S-video multiplexer allows for high quality field sequential output and even more flexibility in terms of previewing 3D images in real time. Focus settings for both optical blocks are now controlled via a synchronized optoelectric mechanism that adds mere ounces to the system and allows precise control over left and right eye focus with one convenient follow focus knob. This new method reduces weight as compared to previous designs, improves accuracy and eliminates the backlash associated with a geared stereo focus system. Zoom functions are also now electronically linked for improved ergonomics and accuracy as well as significant weight reduction as compared with previous generations. Left and right eye lens apertures are now synchronized by a dual channel galvanometric system that ensures matched exposure to both CCD arrays with just one user operated dial. The system provides accurate and consistent brightness and contrast between left and right images and makes "run 'n gun" 3D shooting a reality. Interaxial spacing has been significantly reduced to 2.75" (69.85mm) for a more natural simulation of human vision. An all new carbon fiber and aluminum matte box with two stage filter holder allows a wide range of industry standard 4"x5.6" filters to be employed. Because of its advanced design, which integrates dual on board Mac OS CPUs, dual high-speed hard drives, a high res binocular LCOS electronic viewfinder, high data rate USB 2.0 interface and a 6CCD camera head, the 3DVX3 has unusually high power requirements. To meet these demands, 21st Century 3D turned to Anton/Bauer, the worldwide standard in custom power systems. Their state of the art Dionic 160 offered the best balance between power output and weight. Additionally, Dionic 160 is one of the only batteries in the industry that can power the 3DVX3 at all. This battery is constructed with specialized lithium ion cells originally designed for high rate military applications. Because of these low resistance cells, Dionic 160 meets the power requirements of the 3DVX3 with a total output of up to 10 amps - a capability usually reserved only for nickel based chemistries. Dionic 160 weighs 30% less than a HyTRON 120 but has 30% more capacity, allowing the 3DVX3 to run for up to 2 hour of continuous operating time. An AC power supply based on a modified Anton/Bauer Titan 70 has also been developed. This advanced battery technology contributes in part to the camera's overall weight of just 24 pounds making the 3DVX3 the industry's smallest and lightest high definition stereoscopic camcorder. The 3DVX3 can easily go places and do things that competitive 3D systems simply cannot. Car mounts, steadicam and hand held operation are complex challenges with other systems, but easy options with the 3DVX3. 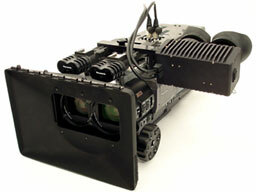 Other high definition 3D camera systems can weigh three times as much as the 3DVX3 or more, and often require separate recording hardware and large support crews. Furthermore, these systems cannot match the dynamic range afforded by the uncompressed 10 bit image quality. The 3DVX3 allows for more setups per day and requires smaller crews to operate. This translates to more efficient production. Directors and cinematographers can now concentrate on producing high quality 3D content without the cumbersome delays and exorbitant expense associated with traditional 3D shoots. "This is the camera we set out to create two years ago," says 3DVX3 inventor Jason Goodman. "It's an evolutionary design that builds on our previous work and takes what we've done to the next level with 1280 x 720p stereoscopic high definition and outstanding dynamic range. At the same time, it's an entirely new design in that we've abandoned tape and created so many new components. The uncompressed image quality and remarkable color fidelity add so much subtle detail that really enhances stereoscopic quality in a profound way. This is the next generation in live action 3D production." The 3DVX3 is available for worldwide hire exclusively through 21st Century 3D. 21st Century 3D is a leading provider of stereoscopic motion picture content and technology. For more deals on current or recently discontinued models, see our best 15" MacBook Pro deals, our best 17" MacBook Pro deals, best aluminum PowerBook G4 deals, best titanium PowerBook G4 deals, best iBook G4 deals, best PowerBook G3 deals, and best iBook G3 deals.